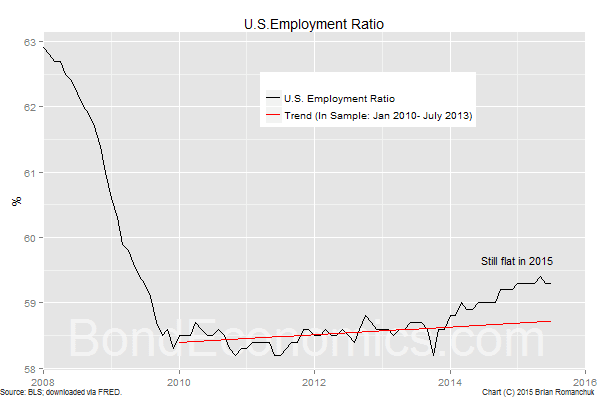 The July Employment Situation report for the United States followed the mediocre trend of previous releases. This gives the Fed cover for a rate hike at some point in 2015. Although I believe that there is no need to restrain the U.S. economy (particularly when the rest of the world looks like it is rolling over into recession), I see the logic behind hiking rates this year. For the bond market, the real question is whether there any hike will be followed up by further hikes. People who believe that long-term bond yields will rise one-for-one with the policy rate may be surprised by bond market's lack of reaction. We could end up with a silly "conundrum" debate, just like the last cycle. The employment-to-working age population ratio was unchanged at 59.3% again in July, leaving the ratio unchanged since January 2015. This measure covers the whole population, which obscures a change in the mix at different age cohorts. The lack of wage growth is not particularly puzzling, as the U.S. economy is just creating jobs in line with population growth. Despite negative real policy rates, which are supposed to be stimulative, there is no sign whatsoever of accelerating economic growth. The issue for the bond market is when the policy rate will be higher than 2% (if the Fed even gets there before the economy succumbs to recession). Since the first rate hike has been so easily postponed, it is unclear why the Fed will not take a lengthy pause at round levels like 1%. The U.S. dollar has been soaring versus its developed market counterparts, and so the external sector is providing restraint for growth. The reality that the policy rate has been essentially zero for about half a decade has finally worked its way into market pricing. My approximation of the 5-year rate, 5 years forward (bottom panel) has dropped to near 3% from the 5% level it had been at up until 2010. Unless the Fed starts hiking by 50 basis points a meeting, it will take considerable time for the 3% level to be threatened by short rates. Therefore, there is no particular reason for those longer term forwards to be significantly revised higher just because the Fed hikes by 25 basis points in September (or December, or ...). In summary, it should not be surprising that the 10-year yield will shoot up to at least 2.5% if and when the Fed hikes rates. This will provoke considerable excitement in the business press, and "I told you so!" comments by bond perma-bears. But once that initial surge has passed, the market would revert to rather boring range-trading around a slowly rising trend. 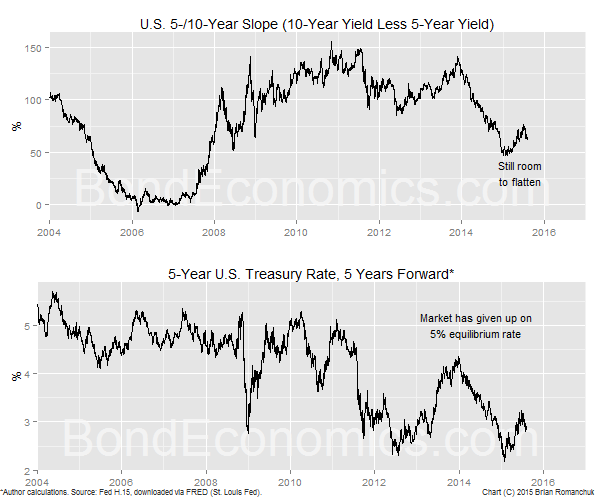 In particular, analysts who use fair value models based on a regression of 10-year yields versus the Fed Funds rate (with a regression beta around 1), may be shocked by the lack of movement in the long end relative to the policy rate. Bonds might underperform cash (or equivalently, short duration strategies outperform), but it will be a game of inches, not a fixed income apocalypse. Good article. Kalacki wrote an article "Politics of Full Employment" which is also along those lines. From a statistical standpoint, Obama's entry into office was badly timed. But the lousy recovery was a bipartisan affair. Explicit job creation is not really on any politician's agenda; everyone just wants to hope that the private sector will create jobs. It does, but very slowly in the current environment.